It's surprising how useful some other trades' tools can be, and engineer's tools are no exception. We use their drills, vices, files and even their squares. The engineer's combination square is made up of four parts, if you count the rule as one piece. The three different stocks slide onto the rule, making it a very versatile tool for measuring and marking out. Its advantage over a standard square is the way the rule can be adjusted in the stock to the length you need. The three heads or stocks will allow the marking of square and 45Âº lines, the marking of centres on round material and the marking of any angle with accuracy. 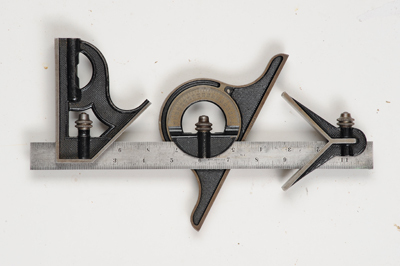 Moore & Wright manufacture quality engineer's tools, and they still offer a good range of combination squares that are both traditional in style and affordable. The advantage of these tools is that they are well made and very accurate. Even second-hand ones are a good bet, unless they have been allowed to get very rusty. 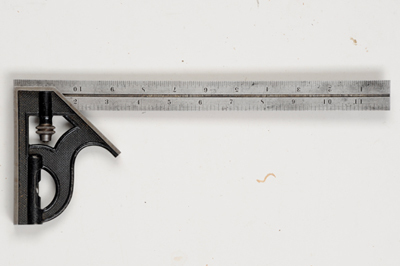 Stanley Tools in the USA made an interesting adjustable square - shown in their 1911 catalogue of woodworkers' tools - an unusual departure from the steel and rosewood models commonly available. It's not quite the quality for a precision engineer, but more than sufficient for high-class joinery and cabinetmaking. They are more basic than a proper engineer's square and perform only three tasks - marking 90Âº, marking 45Âº and checking depth by sliding the rule to fit. The groove in the rule allows it to slide to the end and it can be swung over and slid back the opposite way to make full use of it. This clever idea means that the rule is always with the stock and not likely to get lost. 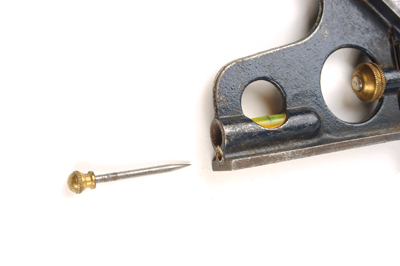 Later types had a marking awl stored in the end of the head like a lot of the engineer's tools have. I like the way patents are often attributed to the actual designer with the company shown separately, in this case Christian Bodmer's basic patent for Stanley was taken out in 1911, improved by Austin Stowell in 1934 and in production from 1911 to 1984. 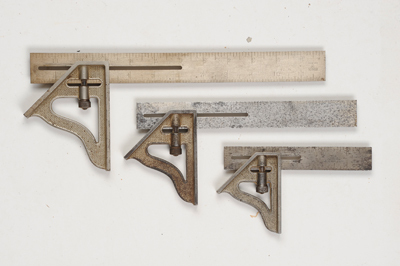 Listed as being 'Inside and outside try square, mitre square, plumb level, marking gauge, depth gauge, and straight edge', Stanley certainly got their money back on their investment, and I have no doubt it was replaced with one made from a cheap alloy or even plastic. What a shame so many companies were forced by 'economics and competition' to abandon the fine tools they had made for so long. If you are lucky enough to come across one of these, snap it up and use it at every opportunity; a perfect tool for workshop or on-site fixing.